Sprinkle the beef generously with salt and pepper. Toss it in the flour and make sure to coat all sides of the meat. Coat the bottom of a heavy bottomed soup pot with about 1 tablespoon of the oil and heat it on medium high until you see it shimmer. Brown the beef on all sides, working in batches so you don't crowd the pan. Add a little more oil as necessary for the rest of the meat. Remove to a plate. In the same pan saute the leek, shallot, onion, celery and carrots for several minutes until the onions start to soften. Add the Sherry and let it cook for a minute, scraping up the brown bits as you stir. Add the meat back to the pan, along with the beef stock and bay leaves. Bring up to a boil, then turn down the heat, cover, and let barely simmer for an hour. Add the barley and let cook for another 30-40 minutes, until the barley is tender. Finish with the Worcestershire sauce, and more salt and pepper to taste. Remove the bay leaves before serving. Note: if you use the pearl onions, add them in at the end and just let them heat through. 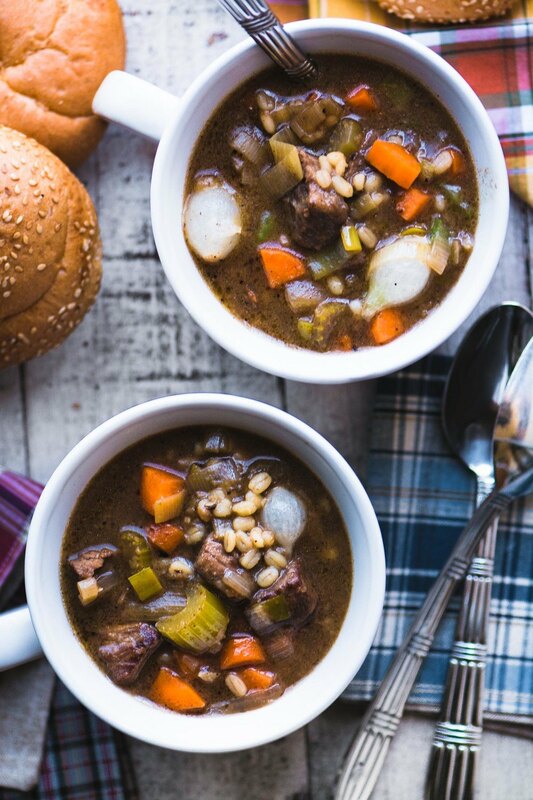 If you refrigerate the soup before serving it will thicken as the barley absorbs the liquid, you can thin it down with extra stock or water as you reheat. For crock pot ~ cook as above, but after adding the Sherry, meat, and stock to the pan, transfer to a crock pot. Add the barley and cook on low for 6 hours. Season with the Worcestershire sauce, salt and pepper just before serving.